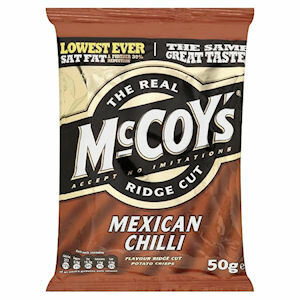 McCoy's Ridge Cut Crisps carry the maximum amount of flavour possible, whether it be punchy Salt & Malt Vinegar, the original Salted, Cheddar & Onion or fiery Mexican Chilli. Whichever variety tickles your fancy, Zepbrook can supply them to your office! 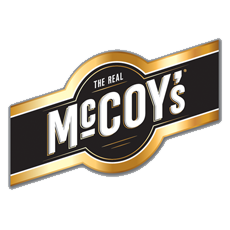 Get your McCoy's from Zepbrook tomorrow: order before 5pm if you're in London (or the M25 area). 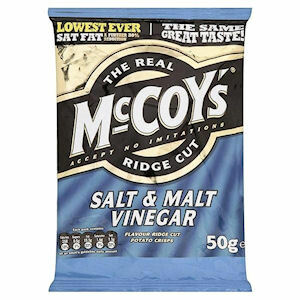 Do you need McCoy's products that are not currently listed on our website? Contact us - we can source and deliver many other products for a competitive price. Call us now on 020 8752 0110 or enquire online. The originator. Starter of mouth parties, presser of your tongue’s joy-button. 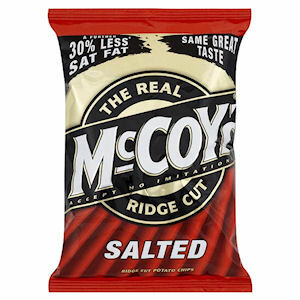 Salted flavour was never broken, so McCoy's never fixed it. They just made it better. They got more fire than a fire fighting fire with fire. But never fear, no fires were harmed in the making of this flavour. We hope. 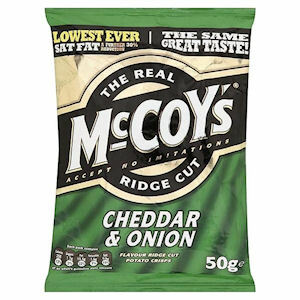 As thick as you like them and built with ridges deep enough to carry the maximum load of our unique full on flavours! A match made in heaven, a seasoning standard, a cheesy punch to the taste buds with an oniony massage that’ll leave you weeping tears of joy. Our flavoursome take on a crisp classic. Sharper than a samurai sword in a suit. Sharper than a swordfish in stilettos. In short, really damn sharp. 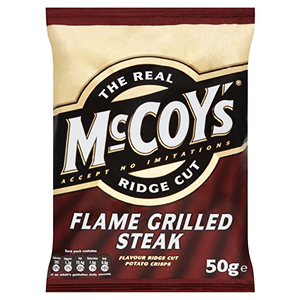 Steakier than a steak on a high-stakes stakeout and meatier than an important meeting about meat: this crisp is going to make you think you’ve eaten the real thing. But you haven’t. It’s just a crisp.